Staff Picks for Video and Board Games of the Year 2017 — GamingWithSwag.com - Dads By Day, Gamers By Night. While some of these games may not have always been released this year this is our staff picks for the top games of the year in the format of their choice. 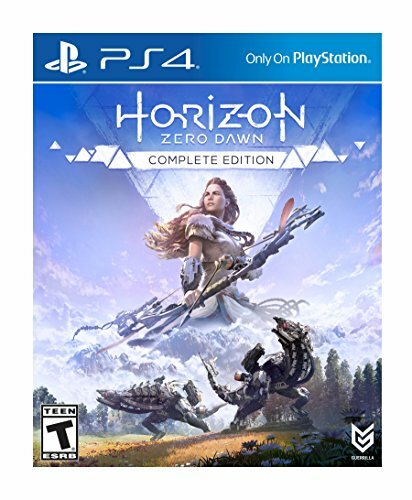 An amazing new game that was a perfect mix of stealth and action built around a compelling story with enough collectible hunting to make you explore the whole world. It was a visual marvel and the best video game I played this year and it wasn't particularly close. Star Wars Destiny - The first set was released last year, but this was my first year playing the collectible card and dice game and I fell deep down the rabbit hole for this Fantasy Flight series. I have worked on getting some of my friends addicted so I can play more although I probably get the most joy just building weird decks and trying to make them work. Small box Game Of The Year - Fantasy Realms - My new favorite small box game released by Wizkids is like Strategic Fantasy Rummy. It is stone cold simple, fast to teach and play, and immensely fun. Nintendo packs a punch with two classic franchises in one year (Zelda and Mario.) Mario inches out just by a margin due to the ease of play and accessibility. Zelda has a very tough learning curve, where anyone can jump into Mario and fave fun. 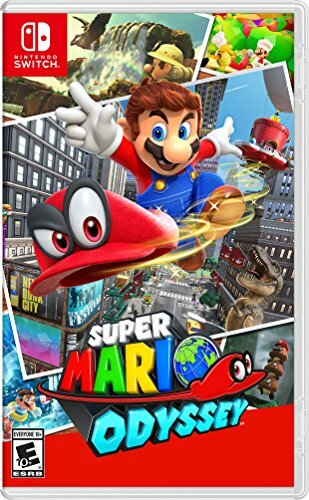 New and innovative worlds and ability system make Super Mario Odyssey my Game of the Year. I am a sucker for all things Nintendo, and this game is no exception. It's Monopoly in name only, and the game is easy to learn and understand. Plus, all of the character tokens have additional unique abilities, and you can easily expand your game by purchasing additional token booster packs. Check out our full review for these reasons and more why this is my Tabletop Game of the Year. When I first opened this game it didn't look like much, and like Dean's vote for Fantasy Realms, sometimes those are the best games. A twist on the typical Yahtzee, Dice Stars requires more strategy than the classic dice rolling game but still is accessible to anyone in the family. For that makes Dice Stars my small box Game of the Year. Honorable Mentions - Destiny 2, Metroid: Samus Returns, The Legend of Zelda: Breath of the Wild, All physically-released Nicalis Nintendo Switch games. 5) Tournament at Camelot – Not being a huge fan of traditional card games like Hearts, I was very pleasantly surprised to find that I really enjoyed this one. It’s a neat little trick taking game with player powers to keep things interesting. Not only did I really like this one, so did literally everyone I played it with. Of course, with the beautiful art and smooth gameplay, it would be hard not to. 4) Catacombs and Castles – The long awaited (at least by me) follow up to the spectacular Catacombs. This version turns the aforementioned Catacombs from a long dungeon crawling epic, to a quick team vs team skirmish game. I’m amazed that they were able to take their flagship game, make some slight rules twists, and come out with a game that feels fresh and different, while still being familiar. Elzra games really knocked (flicked?) it out of the park with this one. 3) Fantasy Realms – The second small box game from WizKids on my list. They have been doing a great job this year putting out fun and affordable games in a small package. This one has taken over the spot as my number one filler game. Super easy to teach (it literally takes minutes) and surprisingly deep, I will never turn down an opportunity to play this. 2) Rajas of the Ganges – At PAX Unplugged this year they had an area with a bunch of games set up to play that either hadn’t come out yet or were just released. I was super stoked to get the most out of it and try as many as I could, but I kept finding myself drawn back to play this one. It’s a weird mix of mechanics that plays unlike any game I’ve played in a while. Highly recommended! 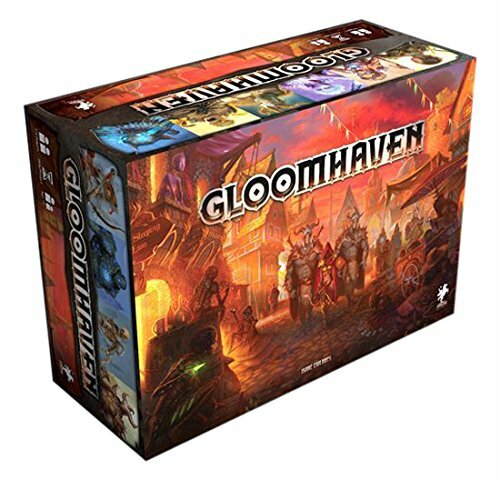 1) Gloomhaven – What is there left to say about this veritable juggernaut of a game that hasn’t been said by countless other reviewers? Gloomhaven is narrative, dungeon crawling masterpiece. I often hear people my age bemoaning the fact that there’s nothing quite like the beloved childhood classic Heroquest. Well guess what? That spiritual successor you were looking for is right here! It’s seldom a game lives up to the amount of megahype that this game garnered but it most definitely does, and with the amount of content it the box, I’ll be playing this for many years to come. Honorable Mention: Kingdom Death: Monster – Even though the new revamped edition came out this year, the original release was in 2015 which kept it off my list. However, if it was eligible, it would have easily made my number 1 for 2017. It’s very expensive, super dark, and a little fiddly, but in spite of all these things (and sometimes because of them), it’s one of the most memorable gaming experiences I’ve ever had. While it’s not for everyone, Kingdom Death is beyond fantastic. Dishonorable Mention: The Oregon Trail - Hunt for Food – Perhaps the most hastily thrown together pile of cards calling itself a game that I’ve ever played. Incredibly luck dependent and lacking any skill, this game was an awful slog to play and it only took about 20 minutes! Yeah, yeah, I know, here’s where you say “But Brad, Oregon Trail was hard too and this is the Oregon Trail game you dummy”! I don’t care how hard a 30-year- old, apple, floppy disk, computer game is, this is 2017 and we should have learned a little more since then damnit! A game of exploration and discovery. There is very little in the way of a linear plot, instead, your own story opens up before you like the immense virtual world that Link inhabits. There is always something just over the next mountain or just around that bend in the river. Breath of the Wild encourages our impulse to push beyond our limits into uncharted territory and does so with gravitas and grace. Not all dexterity games need only to appeal to kids. 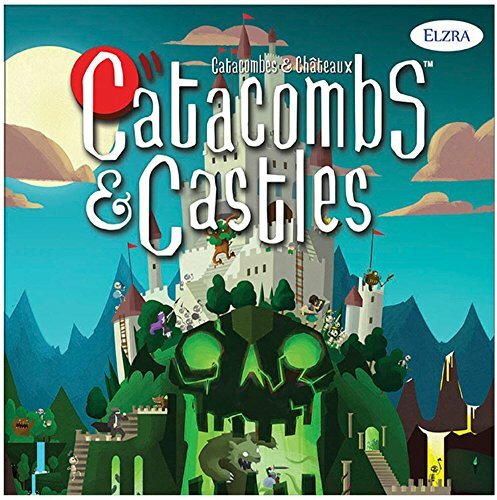 Catacombs and Castles has depth and replayability and is the most fun with a large group. You may be flicking wooden pieces around a board but it never gets dull or repetitive. A dexterity game not just for families and friends but for seasoned board gamers, too. A mashup of Real-Time Strategy and Tower Defense, Iron Marines is a satisfying challenge that, like all the best mobile games, keeps you coming back for more. It builds on it's predecessor, Star Realms, by hitting harder and faster and adding a campaign mode and character decks. The art is excellent, the gameplay is quick, the fantasy theme oozes from every facet of this game. If you like Deckbuilders this is a must-play. 5: Cuphead (XB1) - Every once in a while, a game comes along that is so different and inspiring, providing an experience like no other. Cuphead has a charm that no other game in recent memory has been able to capture. Excellent theme, extremely tight gameplay, and one of a kind graphics all at a budget friendly price point. 4: Crash Bandicoot N Sane Trilogy (PS4) - Activision took many of us back 20 years when this trilogy dropped in the summer. Not only are the games some of the best remasters out there, this release had a lot of people talking about the brand again, generating buckets of hype for whatever is next for our favorite marsupial. 3: PUBG "Playerunknown's Battlegrounds" (XB1) - I didn't understand the hype until booting up my first match on launch night. There's something so fresh and addictive about this game that keeps me coming back for "one more match". While initially ridden with bugs, two patches have since dropped, promising a bright future for this gem for a long time to come. 2: Call of Duty WWII (PS4) - I was skeptical that Sledgehammer Games could top the previous two installments in the Call of Duty universe, however WWII proved from day 1 that any concerns I may have had were not warranted. Campaign, Multiplayer, and Zombies are all stellar, with an excellent "War" mode introduced in the multiplayer, keeping things as fresh as they can be in this 10 year old formula. It's clear that Sledgehammer-Games has grown as a company to join in the ranks of Treyarch & Infinity Ward. 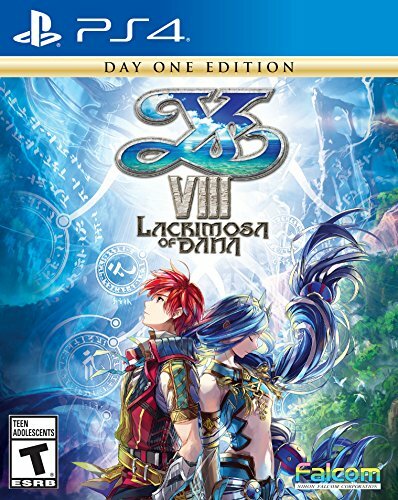 1: Ys VIII Lacrimosa of DANA (Vita) - As my game of the year, Ys VIII changed me. Many years ago, RPGs had a magic that made you feel for the characters almost on a personal level. Falcom captures these feelings all over again, enchanting the player with this amazing universe that is more memorable than any RPG in recent time. What's even more incredible, they somehow fit the whole AAA experience on the Vita, effectively placing it among the best games on the platform. Anyone looking for an RPG experience to get lost in on the go - look no further, and give this underrated gem a chance! Don't have a Vita? The PS4 version contains a bit of extra content, and plays at a solid 1080p/60fps, with PS4 Pro support bumping it to a beautiful full 4k experience! 5. Dice Forge - The thing that draws your attention to this game is the art. It’s absolutely wonderful. What keeps your attention is the light, but still interesting choices you must make. There is plenty of variability in the cards available to purchase, which helps add replay value to the game. Plus, you get to craft your own dice...how awesome is that? One of the rare games I wish was actually just a shade longer. 4. Ethnos - This game has been unfairly maligned this year because it isn’t the prettiest. Once you get past the drab board, you will find an extremely fun game of set collection, and area control, mixed with chicken. A ton of options that make each game play wildly differently. If there was just one game I would tell everyone they needed to at least try, it would be Ethnos. 3. Azul - This one makes my list just because I’m really good at it. That and it’s one of the best light puzzle style games on the market today. Easy play, great tile pieces, and a couple different ways of playing all combined to make Azul one of the hottest games this holiday season. 2. Century Spice Road - Plan B Games had a very, very good first year in business. Between Azul and Century Spice road, they released two of the must have games of the year. Century Spice Road is a spice trading game, where you trade spices based on cards you purchase from a public market. In this sense, it’s an engine building game, as you are trying to find cards to play in succession to build your spice collection in order to fulfill demand cards. 1. 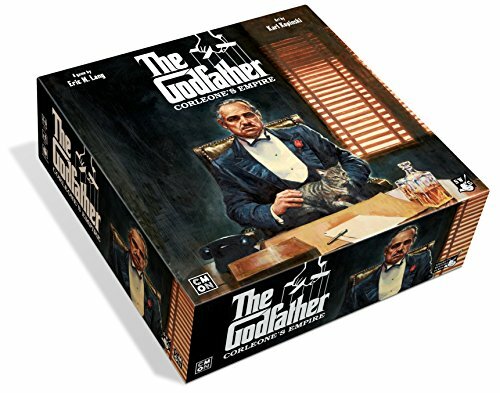 The Godfather: Corleone’s Empire - I’ll admit. I had zero expectations that I’d enjoy this game. I generally like the designer’s (Eric Lang) games, but many of his recent games just haven’t hit my particular sweet spot. I did not expect a quick-playing / worker placement / area control game. Yet that’s exactly what The Godfather is. Mix in a quick auction mechanic, great pieces, keep the whole thing at a shade over an hour, and you have the makings of my favorite game this year. Honorable Mention: Dinosaur Island - I got to play a game of this, casually known as Jurassic Park in a box, just a couple days ago. It’s fantastic. However, I was unwilling to put it on my top 5 list after only 1 play. It truly does feel a bit like the old Theme Park style PC games, mixed with dinosaurs. It is a heavier game than I typically enjoy, but once you get into it, you forget how fast time goes by. If you get the chance, try it. 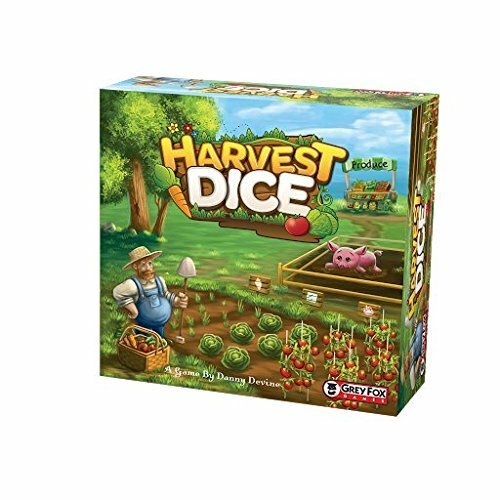 Small Box Game of the year: Harvest Dice: Harvest Dice is a tiny little dice drafting roll and write about planting vegetables, and feeding you pig. There’s just a little bluffing in the game, and plenty of ways to score hidden points, which make the game tense all the way to the end. A great little $15 filler. I wanted to write a bit about video games, as this was the year I spent the money on a PS4. However, I only played 2 games actually released in 2017, and neither are game of the year material. I did play a lot of board game apps on my phone, so here are the 3 best I played this year (and 2 to look out for). 3. Race for the Galaxy - This was one of my favorite card games until expansions muddied the experience to the point of unpleasantness and the superior Roll for the Galaxy made the card game obsolete. The app allows me to play with just the parts I like, and forget the parts I don’t...and gets the job done in about 15 minutes. Slick, easy to understand interface. 2. Through the Ages - I shouldn’t like this game. The board game is a 4 hour slog. I have played it once, and mentally checked out of the process about halfway through the game. The app, however, has a tremendous tutorial that teaches all aspects of the game. Plus, it plays the whole shebang in under an hour. If you, like I was, are scared of this game, give the app a try. I don’t know if I want to play the real version again, but I truly love the digital version. 1. Onirim - Onirim is a rather abstract solitaire card game wandering through a dream, trying to find the doors that let you out...but watch out for the Nightmares. The card game is a classic, recently reprinted in a wonderfully overproduced edition. However, the main game is very simple. The biggest issue with the real game is that you have to shuffle the deck 15-20 times a game. Here, the app takes care of all that for you, allowing you to concentrate on the task at hand. This is my go to “sitting at the auto dealership, waiting for my car” game. Honorable Mention: 7 Wonders - The long awaited, much maligned 7 Wonders app finally arrived recently, and it’s very fun. It’s a little more no nonsense than I was expecting. This isn’t totally a bad thing, as the whole game takes barely 5 minutes to play, but I feel like just a bit more pomp and circumstance might make this a better experience. Honorable Mention 2: Friday - Friday is another one of my favorite solo games. It’s a deck builder about tying to help Robinson Crusoe learn survival skills. There are a few oddities in the app that make it less intuitive than it should be, which is why it’s not on my list, but it’s a terrific game that more people should know about.